Iggy to the Shark thread please. Oh the hijinks of the stand up set! Do try to keep up, skip. You're spending too much time in radical left land. A week of good waves, despite the bastards opening all the river mouths along the coast, surfing in black water was getting a bit creepy. Swivel can you send me some more info about the access issue? That's right in the ACS wheelhouse, I'll get the board onto it next week. Surfer wrestles Bull Shark onto the stones at Lennox Head. Been quite a few bulls around. I got bumped hard down there this time last year at the Point. On the day two surfers were attacked by sharks around Gracetown, a shark watch helicopter crew member says he saw fifteen large sharks between North Point and Kilcarnup. 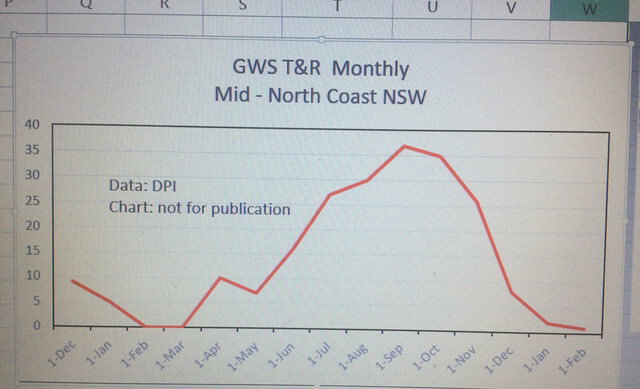 Not much more than a year of data to draw solid conclusions, but here’s a monthly summary of GWS tags from the DPI drumlines from Lennox to Forster, Dec 2016 to March 2018. Hopefully the DPI are putting all that data together. And will publish findings, given its taxpayer funded. I merely input a few numbers into excel two hours per month, out of interest. But yes lower water temps and whale season might be the biggies.